Efamol Efalex is a source of omega-3 fatty acids (EPA and DHA) for the maintenance of good health. 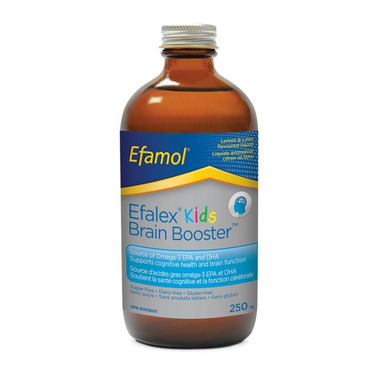 It helps support cognitive health and brain function and also the development of the brain, eyes and nerves in children up to 12 years of age. Sunflower oil, lemon oil, dl-alpha tocopheryl acetate, natural lime flavour, dl-alpha tocopherol, thyme oil. Keep out of reach of children. Store in a cool, dry place. Refrigerate after opening and use within 3 months. I bought this product after reading about it and on the advice of a friend who has used this for several years with her daughter. My son has some symptoms of ADHD and often struggles to control himself in the classroom. After a week, there has been a significant improvement in his attention, self regulation and in his printing and reading. According to him " things are less mixed up" in his brain. He happily asks for his " brain food" every day. He loves the lemon lime flavour. I will continue to use this!!! !